It always interests me to know what growth percentile my daughter is in. For some reason I gain satisfaction from knowing that my daughter’s weight gain is average. The MedCalc: Interactive Growth Charts allow you to view your child’s growth on the same growth chart that most doctors use to determine what percentile they are in. You input the birth date, gender, height, weight, and head circumference, and then choose from one of 11 different growth charts. You only need to input the specific information for the chart you want to view. The site also has Newborn Baby, Pre-Term (Premie) Child, and Down syndrome growth charts available. 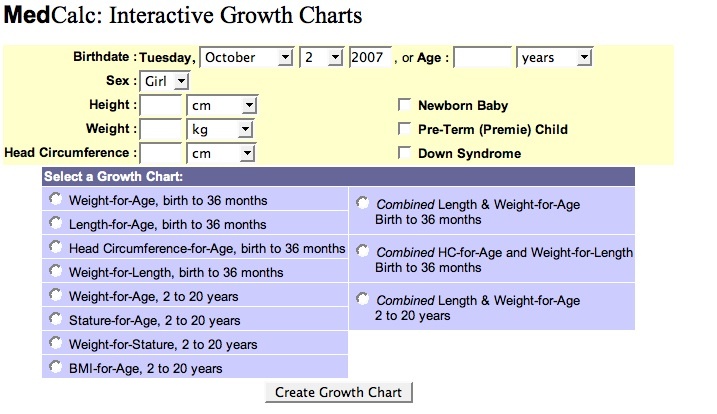 Check out your child’s growth at MedCalc: Interactive Growth Charts. This is a great site! I love finding out my kids’ growth percentiles too! Now if I could just get my kids to stand still long enough for me to measure them! My first daughter has always been in the 90+ %tile for both height and weight (9 lbs. at birth). I wonder if this has anything to do with lots of Ben and Jerry’s while I was pg…(?) My 2nd was also born 9 lbs. (again with the ice cream) but quickly settled into the 65-70%tile range. When I expressed concern because she was so “skinny”, my doctor just laughed. Angela that is SO TRUE! It is good to remember when folks are always making comments about your baby’s size. I get a wide spectrum of comments about my baby. She is either really big for her age or “Oh my, she is so small!” Keeping track of her growth helps me keep her size in perspective. I remembered this post from last year, and it’s been super helpful keeping Addie’s growth in perspective!